With all the cold weather we have been having lately, a nice, hot chocolate feels so warm and inviting. 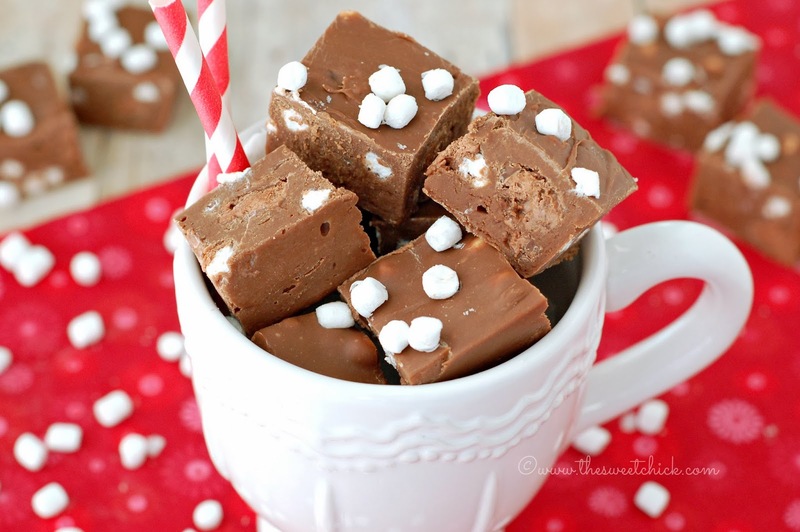 Now this fudge may not be all warm and cozy, but the flavor is definitely inviting. It is has a smooth, creamy texture and is filled with Jet-Puffed Mallow Bits, and chunks of 3 Musketeer Minis with Hot Cocoa/Marshmallow Filling. You can now eat your hot chocolate while sitting by the fire. Now I am not usually a fan of milk chocolate. I am a dark chocolate lover, but for Ghirardelli I will make an exception. I wanted a chocolate that wouldn't over power the taste of the 3 Musketeers. I had found these Hot Cocoa with Marshmallow 3 Musketeers at Walmart while shopping for Christmas decorations. I just opened the bag recently. I am amazed they lasted that long. These are even better then the regular 3 Musketeers. Mmm...just look at all that lovely chocolate. Don't worry there will be plenty of 3 Musketeer bars left after you make this recipe. These Mallow Bits are just the cutest things. I remember making the Swiss Miss hot chocolate with these little marshmallows in them and always thinking they never put enough in the packet. Now I can pour a whole tube of them into my hot chocolate. 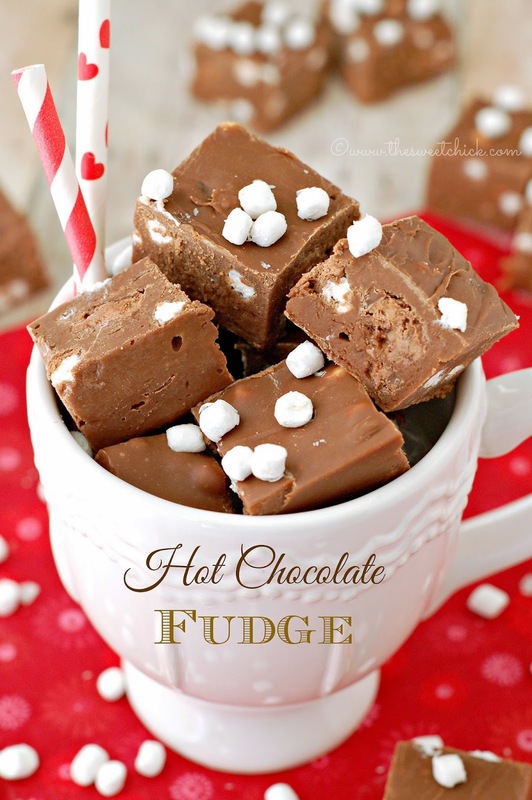 This fudge recipe is so easy. It just requires a lot of will power to resist eating it just like this. I had to add more Mallow Bits to the top. I couldn't help it. I am such a kid. And it looks cooler. This Hot Chocolate Fudge came out so good. It's really creamy and the chunks of 3 Musketeers are soft so the texture of the fudge is consistent. And the Mallow Bits which are usually crunchy, absorbed the moisture from being in the fridge and became chewy like regular marshmallows, so it was perfect. It tastes just like hot chocolate. Your kids are going to love this. Chop the 3 Musketeers into smaller pieces. I chopped mine into 6 pieces each. In medium saucepan over low heat, combine the condensed milk, the chocolate chips, and half of the chopped 3 Musketeers. Heat and stir until all chocolate is completely melted and the mixture is almost smooth (the chocolate chips will be melted, but the marshmallow centers of the 3 Musketeers may not completely dissolve). Remove from heat, stir in the vanilla, the other half of the chopped 3 Musketeers, and 1/2 cup of the Mallow Bits until completely combined. Then spread the mixture evenly onto a parchment paper lined 8″ x 8″ pan or glass dish. Sprinkle the top with a tablespoon of Mallow Bits. Place the container in the fridge and chill until set (about 2 hours). Remove from fridge and gently lift the parchment paper to remove the fudge from the pan ( you may need to leave it out for a few minutes before removing). Slice and serve. This looks so delicious! Thank you for sharing at The Wednesday Round Up! We hope to see you back next week! You are welcome Emily. I will be back again! This sounds awesome! I love hot chocolate and I love fudge. This is perfect for me! They are pretty fabulous Cathleen. Yum! I love hot chocolate and fudge! I'm a new follower from the "Weekend Potluck"
Thanks for coming by Melissa. I hope you find a few more things that you like here!